Boeing Sets Airplane Delivery Record: What's Next For BA Stock in 2019? Shares of Boeing BA surged 3.3% Tuesday after the aerospace powerhouse reported record-setting aircraft deliveries in 2018 to help it top rival Airbus EADSY. Boeing, however, fell just shy of its own delivery target. So, let’s see what investors should expect from BA’s Q4 and fiscal 2019 financial results. Boeing said on Tuesday that it delivered 806 commercial jets in 2018, to help it set a new record and fly by 2017’s 763 deliveries. The U.S. industrial giant topped European rival Airbus, which reportedly met its own 800-jet target. Investors should note that Boeing’s deliveries did fall just short of its own target that called for between 810 and 815 aircraft because shortages of engines, fuselages, and other parts slowed summer 2018 outputs. On top of impressive delivery totals, Boeing also added 893 new orders last year. This included 203 airplane sales in December as global demand for air travel continues to climb. The new orders are valued at over $143.7 billion and have been added to Boeing’s roughly seven-year backlog. Boeing said that Hawaiian Airlines HA switched from the Airbus A330 to its 787. American Airlines AAL and United Airlines UAL also bought more Dreamliner jets. Meanwhile, Boeing’s 777 models continued to perform well, driven by sales from FedEx FDX, DHL Express, and others. Moving on, Boeing announced in December a new quarterly dividend of $2.055 a share, which represents a 20% climb from the $1.71 per share Boeing paid throughout 2018. The company also detailed what it expects to be a significant increase in demand in India over the next 20 years. 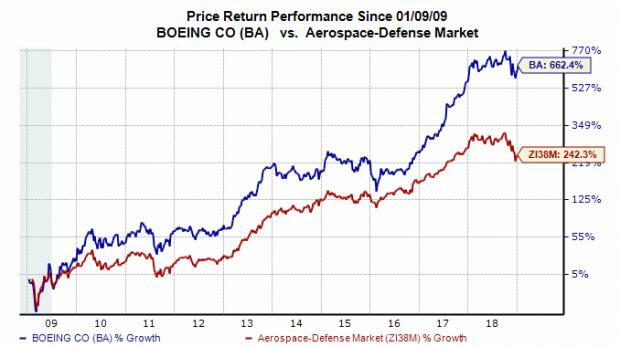 Boeing stock has climbed roughly 9.5% over the last year, which helps BA crush its peer group’s 9% average decline. This industry includes General Dynamics GD, Lockheed Martin LMT, Northrop Grumman NOC, and Airbus. Shares of Boeing jumped 3.33% to $339.04 a share through early afternoon trading on the back of its delivery report release. Fellow Dow giants Apple AAPL, Walmart WMT, DowDuPont DWDP, and Caterpillar CAT all climbed as well. Despite Tuesday’s climb, shares of BA still rest roughly 14% below their 52-week high of $394.28. Boeing’s Q4 2018 revenues are projected to pop 4.8% to hit $26.59 billion, based on our current Zacks Consensus Estimate. This would come after BA’s Q4 2017 revenues jumped 9%. The firm’s full-year 2018 revenues are projected to pop 6.6% from $93.39 billion in 2017 to $99.55 billion. Looking ahead, the firm’s first quarter 2019 revenues are expected to climb 7.1% to reach $25.03 billion. Plus, Boeing’s full-year 2019 revenues are projected to surge 6.6% above our fiscal 2018 estimate to hit $106.1 billion. Investors likely won’t be pleased to see that BA’s adjusted Q4 earnings are expected to slip by 6.5% from the year-ago period to $4.49 a share. Despite the expected Q4 downturn, BA’s fiscal 2018 earnings are projected to soar nearly 25%. Better yet, the aeropace power’s fiscal 2019 earnings are expected to climb 20.3% above our 2018 projection. This estimate alone could help propel BA stock forward this year since rising earnings have been proven to be one of the best long-term indicators of positive stock price movement. Boeing is a currently a Zacks Rank #3 (Hold) based, in large part, on its recent earnings estimate revision activity. The company also sports an “A” grade for Growth and a “B” for Momentum in our Style Scores system. With all that said, Boeing stock could be one to consider at the moment.